A choral prelude by Nicolaus Vetter, found in manuscript Mus.ms. 22541 III owned by the Staatsbibliothek zu Berlin The recording was done the sampleset, made by Organ Art Media, of the Arp Schnitger organ in Steinkirchen. Score Vetter, Komm, Heiliger Geist, Herre. Johann Georg Schübler (1720 (?) - 1755) was a German engraver and organist, who belonged to the Schübler family of artisians from Zella in the Turingian forrest. He studied with Bach in Leipzig during the early 1740s and spent the rest of his life as an organist and a teacher. 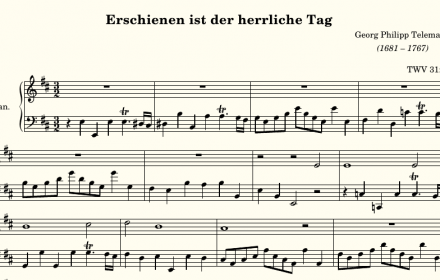 This piece by Gattermann is transcribed from an old edition (about 1790) by Johann Christoph Kühnau . The recording was done on the sample set of the Silbermann organ of the Stadtkirche Zöblitz by Prospectum. 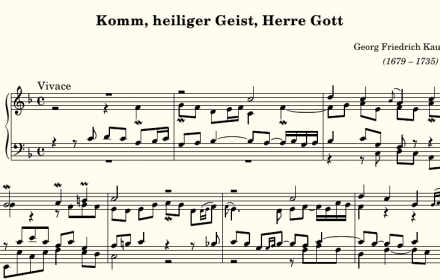 Score Gattermann, Vom Himmel hoch, da komm ich herr Performance Gattermann, Vom Himmel. 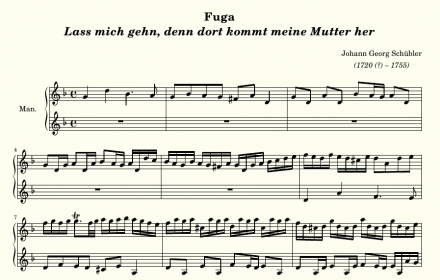 Johann Caspar Ferdinand Fischer (1656 – 1746) was a German Baroque composer. Not much is known about him. Most of his works did not survive. 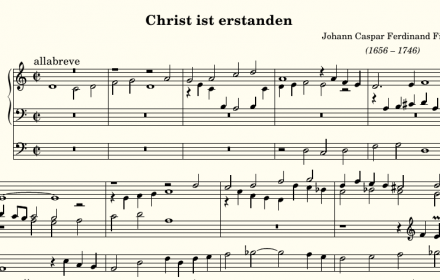 One of the works that did survive is a ricercare on the first phrase of the choral Christ ist er standen. It can be found. 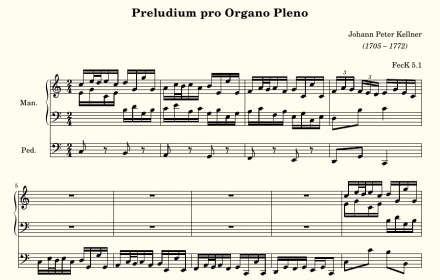 The second Preludium by Kellner, transcribed from manuscript Mus.ms. 11544 owned by the Staatsbibliothek zu Berlin. That manuscript has, I think, a bar missing. 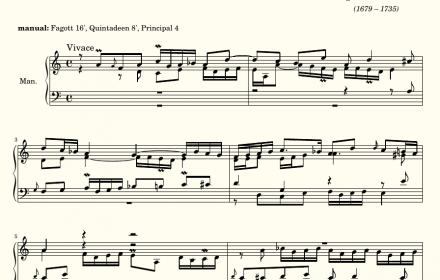 Bar 27 in the score (below) is substituted by me; omit it if you want to play the version as it is in the manuscript. The recording. 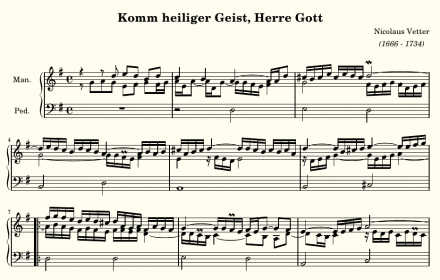 The second prelude by Kauffmann on Komm heiliger Geist, Herre Gott in manuscript Mus.ms. 22541 III owned by the Staatsbibliothek zu Berlin The recording was done the sampleset, made by Organ Art Media, of the Arp Schnitger organ in Steinkirchen. The Gedackt 8' and the Krumhorn 8' are used, together. Michael David Samuel Gattermann (1748 - 1829) was Kantor in the St. Petri Kirche in Berlin and taught at the Kolnische Gymnasium. He was a pupil of Johann Philipp Kirnberger. He was an educated musician with particular interest for church music. 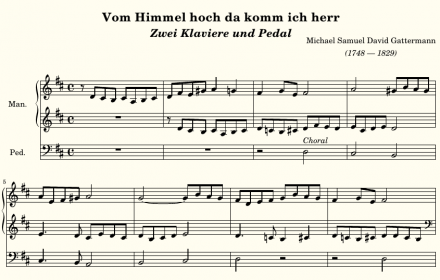 The choral prelude Komm o komm, du Geist des. 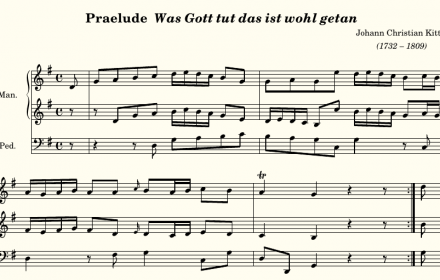 The chorale prelude Was Gott tut dass ist wohlgetan can found in manuscript Mus.1-U-514, owned by the Staatsbibliothek zu Berlin. 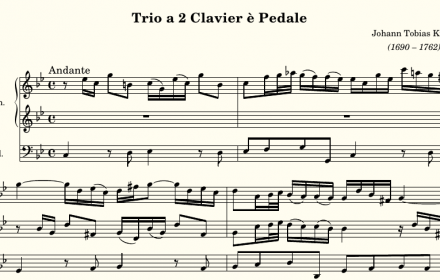 It is just over a minute long, so it's one of the shortest chorale preludes around. The recording was done on the sample set of the Van Dam organ (1832). The chorale prelude Nun freut euch, Gottes Kinder (found in manuscript Mus.ms. 22541 III, owned by the Staatsbibliothek zu Berlin) has the same registration as Komm heiliger Geist, Herre Gott: Fagott 16', Quintadeen 8' and Principal 4'. That's not a combination of stops that's readily available on most organs. On. 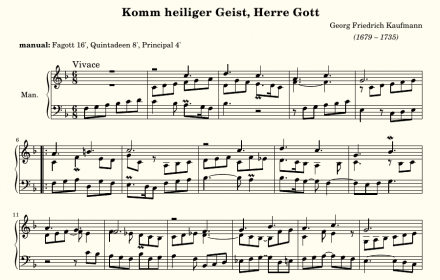 The chorale prelude Komm heiliger Geist, Herre Gott was transcribed from from manuscript Mus.ms. 22541 III, owned by the Staatsbibliothek zu Berlin. The recording was done on the sample set of the Silbermann organ of the Stadtkirche Zöblitz by Prospectum. Kaufmann prescribes a unusual registration for this piece: Fagott 16',. 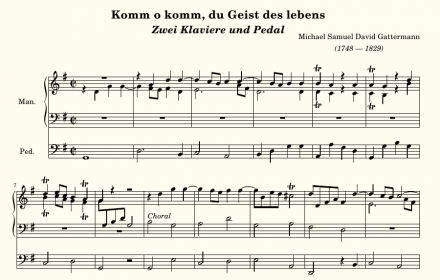 Johann Tobias Krebs (1690-1762) was a German baroque composer and organist. He studied with both Johann Gottfried Walter and with Johann Sebastian Bach. In 1710 he was appointed Kantor and organist at Buttelstedt, near Weimar, and in 1721 he became organist and headmaster at nearby Buttstädt, where he remained until. 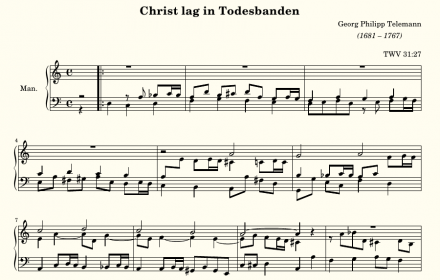 Another of the chorales preludes by Telemann to be found in manuscript Mus.ms. 22541 III owned by the Staatsbibliothek zu Berlin. It is a bicinium and though it may look simple, it is not. The recording was done on the sample set of the Van Dam organ (1832) from Tholen by. Another one of the Telemann chorale preludes to be found in manuscript Mus.ms. 22541 III owned by the Staatsbibliothek zu Berlin. A somewhat dark prelude for a festive occasion. The recording was done on the sample set of the Silbermann organ of the Stadtkirche Zöblitz by Prospectum. Score Telemann, Erschienen. 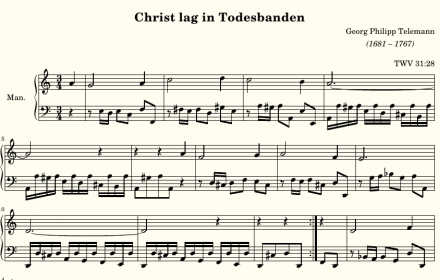 This is the second Choral prelude on "Christ lag in Todesbanden" to be found in manuscript Mus.ms. 22541 III owned by the Staatsbibliothek zu Berlin. The recording was done on the sample set of the Van Dam organ (1832) from Tholen by Voxus Organs for Hauptwerk Score Telemann, Christ. 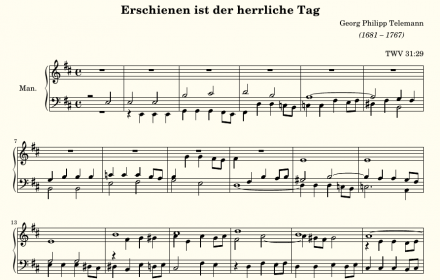 Georg Philipp Telemann (1681–1767) was a German Baroque composer and multi-instrumentalist. After studying in Magdeburg, Zellerfeld, and Hildesheim, Telemann entered the University of Leipzig to study law, but eventually settled on a career in music. He held important positions in Leipzig, Sorau, Eisenach, and Frankfurt before settling in Hamburg in.